A pair of precision tools that include an ultra needle nose pliers and a flush cutter for trimming filament and removing support material from 3D printed parts have been introduced by Xuron Corporation of Saco, Maine. 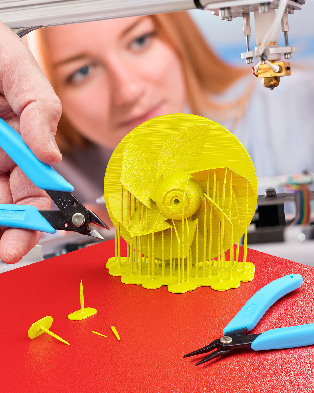 XURON® 3D Printer Hand Tools are ideal for trimming filament and removing post printed support struts. The two tools include the Model 450 Tweezer-Nose™ Plier which has precise tips capable of holding a human hair and the Model 170-II Micro-Shear® Flush Cutter which produces a clean, square cut using shearing action for trimming filament and cleaning up printed parts. Made from alloyed steel and hardened for high reliability and long life, XURON® 3D Printer Hand Tools have glare-eliminating black finish to be easy on the eyes and feature contoured, non-slip rubber grips and a Light-Touch™ return spring. The Model 170-II Cutter has an angled head for easy positioning and the Model 450 Tweezer-Nose™ Plier has precision tips to hold the thinnest parts.